2 posts categorized "Stuff for Sale"
I've been carrying the same purse since February of 2006. I know this because I blogged about it. That's pretty sad for someone who makes purses, not to mention not very good advertising. You can imagine it's beginning to show a little wear at this point. I've tried to make myself a new bag, but each time I've made one it quickly disappears, only to reappear on Alyssa's arm. This time I got smart and made one for her first, making the odds of keeping mine a little better. 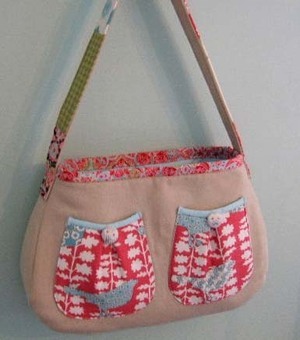 This purse combines some of my favorite things, patchwork, linen, quilting and birds, so I'm definitely keeping it. If anyone else is past due for a new bag I have a couple listed here along with some other new items. 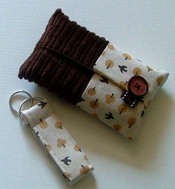 I'm not the only designer stocking my esty shop. Check out the cute fabric covered push pins Alyssa made. I listed a few of my small items in my Etsy Shop if anyone wants to do a little early Christmas shopping. Sorry for the shameless self promotion. It's not really totally without shame. OK, I'm completely embarrassed to be asking you to check out my shop. You don't have to go if you don't want to, feel no pressure from me... see why I don't sell cars? I'm a terrible salesperson, but I'm an OK seamstress and if you're in the market for a wristlet or a travel tissue pouch with a matching keychain, I can hook a sista up.... or a brother, moms and dads welcome too.